Salobreña is not very happy with its neighbour at the moment thanks to Almuñécar publishing a video of the Salobreña fish market in a negative light. We’re just months away from the municipal elections and the Almuñécar Mayor is keen to get her market building demolished and a new one built in its place, so somebody from her party made a short video of Salobreña’s recently renovated fish market with quite a few stall shutters down, implying that fish & veg markets are a thing of the past. The Mayor of Almuñécar has enough opposition within the town itself over her project to demolish the municipal market’s without getting the whole of Salobreña, including her own party there, lined up against her. The Almuñécar Town Hall has rushed out to say in its defence that images of a traditional fruit & fish market in ‘economic decay’ just reflect reality and should offend nobody. The Salobreña Town Hall is taking it calmly and has called upon their opposite numbers in Almuñécar not to start a conflict between institutions. Conchi Ramos, who runs a stall in the Salobreña fish market and who has organised several cultural events to breath some life into the market, is far from happy, too. 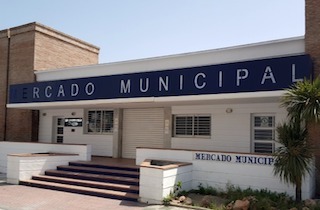 “Making videos that attack the Salobreña Municipal market is pretty low; we’re not some sort of enemy against whom to launch such a campaign,” she commented. She says that the problem is that the parking under the market is closed because nobody has come forward to run it and the Town Hall is strapped for cash to do anything about it. “It’s mind blowing because the footage is manipulated. They gave me an extensive interview but none of it was included, probably because she pointed out that the building was completely renovated and attractive, with customers and in good health. In the meantime, Almuñécar’s plan to demolish their municipal market has run aground because nobody came forward with a bid for the contract, which would entailing footing the bill for demolishing the old building and the building of a new one, in exchange for a long-term lease. Unless somebody comes forward soon then the Mayor is going to face her second municipal elections promising a new market with the old one standing staring her in the face. This entry was posted on Thursday, January 31st, 2019 at 9:43 am	and is filed under Almuñécar, Salobreña. You can follow any responses to this entry through the RSS 2.0 feed.